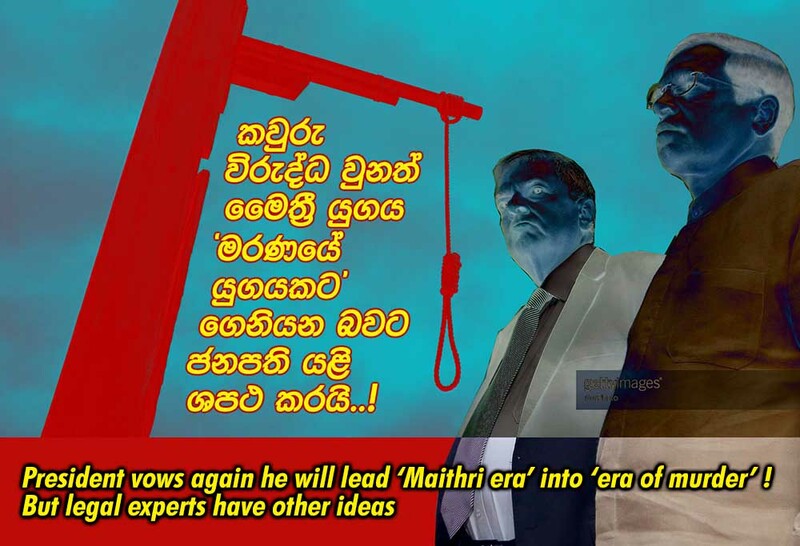 (Lanka e News -23.July.2018, 11.00PM) President Sirisena while giving way to ‘era of murder ’ replacing the ‘Maithri era’, drew attention to capital punishment again last 21st to announce , no matter who says what , death penalty will be implemented in respect of those found guilty of heroin charges. ‘When building a virtuous society if people cannot be corrected by telling kindly, like in most other countries of the world , that goal has to be accomplished through unkindly actions ,since the aim is to achieve what is good . 1.4 % of the population of this country is addicted to drugs. I have got the cabinet approval to implement capital punishment against drug dealers. Hence , I am vested with that power now. I shall therefore see to it that death sentence is implemented against the drug dealers irrespective of whatever opposition mounted. I have summoned the chiefs of the prisons, judicial and other relevant spheres on Tuesday next . I shall be appointing a committee represented by them. That committee only will decide who are the individuals to be subjected to capital punishment as well as the time frame. Those who are mounting opposition have not even lent a hand to avert this national disaster in this country. Hence , I wish to state clearly I shall not endorse the views of those opposing under any circumstances. I shall not yield to that. The decision we have taken in this regard shall not be changed’ the president emphasized. Are there provisions in the constitution to implement what president is saying ? No sooner the president and the cabinet decided to implement the capital punishment than they have found themselves in a thicket of difficulties with new issues springing up. The SL courts deliver death sentence only against those who committed murder , and large scale drug dealers. It is worthy of note ,to implement the capital punishment in SL there is are no legal provisions to say there must be somebody’s committee .Following the court verdict , simply with the president placing his signature , the decision can be implemented. During the last 40 years such presidential signatures had not been placed . Therefore , if it is the committee which is going to decide that the president shall sign the capital punishment against the drug dealers , then surely that committee ought to be one vested with greater powers than the executive and the judiciary . In that case , who is appointing such a committee ? Is it the executive who is making that appointment? Or the Constitutional council ? Is there room for such appointment under the laws? Article 34 of the constitution stipulates clearly in regard to how the presidential pardon ought to be granted when the accused is confirmed guilty by court though the president has not indicated what other way the capital punishment can be implemented by him. Therefore if the president is to appoint a committee to again decide on the death sentence which is to be implemented by him , the latter has clearly laid himself bare to the liability of violating the constitution under article 35 (2) (i) . According to legal experts , as there is no provision in the present constitution to implement what the president said in Polonnaruwa, a prior constitutional amendment has to be made if the president wishes to stand by his Polonnaruwa enunciation. If the capital punishment is to be implemented against the drug dealers found guilty , that must also apply to the prisoners who are found guilty of committing murder too. Otherwise the crime of dealing in drugs will become a graver crime than the crime of murdering another. The laws however have to be implemented fairly and justly in respect of everyone without discrimination . That is capital punishment must be implemented indiscriminately against all those whom court decides should be sentenced to death . Or else it will create a situation where the president or the committee can hang whomever they want , and refrain from hanging whom they do not want to. Is this a perilous journey towards a volcanic eruption? Meanwhile 9 powerful western countries including the Western Union had made a joint announcement requesting the president to change his decision . The media reported that if the decision is implemented , the GSP plus concessions will be withdrawn again. It is well to recall the GSP plus concession was withdrawn owing to the lopsided policies and untoward conduct of the Rajapakses then. This government however immediately after coming to power considered getting back the valuable GSP plus concession as its most primary and paramount task for the benefit of the country . Hence it took steps within the first week itself to put right what Rajapakses muddled up. Despite its prompt action , it took over a year to get back the GSP plus. It is thereafter the country earned a record revenue from exports last year. In the circumstances it will be a matter for surprise , if the pro good governance masses do not turn around to ask from him, is that the destruction you threatened then you are trying to wreak now on the country ? In the past , when the politicians loudly bragged ‘ I shall do it no matter who opposes,’ it was proved that those politicians could not sell even a lottery Board ticket when the people turned against them .